Humans and pets aren't the only ones who need to be wary of heat exposure in the summer months—higher temperatures also put higher stress on wildlife such as fish. 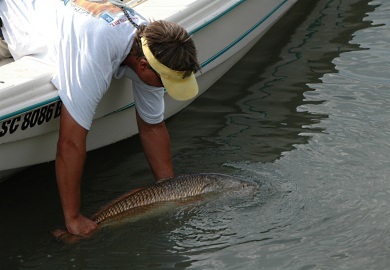 This summer, S.C. Department of Natural Resources (DNR) staff are urging anglers to use best practices when catching and handling fish they plan to release, particularly large game fish such as red drum and tarpon. Summertime fishing places greater pressures on fish than in cooler months, making the animals more susceptible to injury and death. Warmer waters contain less dissolved oxygen, which fish need to "breathe." When combined with the stress of a rod-and-reel fight, hook wounds, and being removed from the water, fish may not survive their catch-and-release encounters with anglers. The largest game fish are often the most valuable in terms of their ability to produce offspring. The contribution of one large female fish to the future of a population can exceed the contribution made by many smaller female fish. Because many of these fish are hooked multiple times throughout their lives, surviving catch-and-release encounters is critical for healthy fish populations. "When practicing catch and release, anglers should put the same amount of effort into ensuring the healthy release of the fish as they put into catching it," said Robert Wiggers, DNR's game fish tagging program coordinator. In order to reduce the fight time, use tackle that is appropriately sized for the fish you're targeting (that is, heavier tackle for large fish). Keep fish in the water whenever possible. Handling fish out of water can damage their protective slime coating and distress the animal, making it less likely to survive. If you do need to remove a fish from the water, keep the fish in a horizontal position and support its body weight. Never hold a fish in a vertical position. Take time to revive a fish by holding it gently in the water, allowing the current to move across its gills, before releasing. Rather than hauling a large fish out of the water for a photograph, take pictures of the fish being revived in the water.